Perhaps one of the greatest attributes of machine embroidery is its versatility. Embroidery can easily stand alone or, when combined with pieced blocks, become a personalized second-dimension embellishment. I fussy-cut four 6.25-inch blocks from a striped fabric (I used Jackie Robinson's "Roses" from Maywood Studio) so that the diagonal dividing line ran across opposite corners. 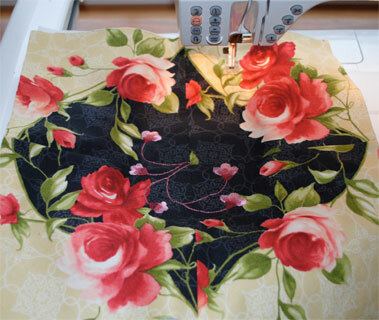 Fussy cutting involves cutting blocks from specific areas of fabric so they are uniform rather than random. Cut two sets of two identical blocks. It is helpful to use clear plastic template material cut to the size of the block. When you have a block you like, mark fabric landmarks on the plastic template with permanent marker then move the template over the surface of the fabric to align the landmarks and cut additional blocks. In this case, the blocks included a light half and a dark half. Because the stripe is scalloped rather than straight, the result is a curvy diamond in a square when assembled. Press blocks. Arrange them so that they form a diamond in a square. Depending upon how they are rotated, you will either have a light center diamond or a dark center diamond. Sew them right sides together pressing seams to one side. Add a fusible mesh stabilizer to the back of completed diamond block for added support. 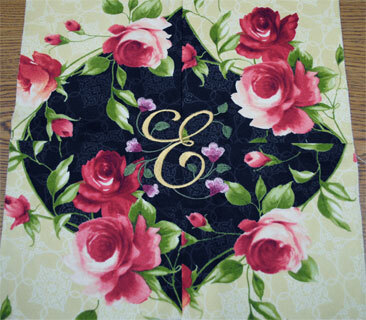 In the middle diamond, I decided to personalize the project, selecting a single monogram with floral accents. Instead of following the color chart, I substituted thread colors that complimented existing fabric colors. Hoop paper-backed adhesive stabilizer. Carefully score the paper side and peel it away from the inside of the hoop. Center the assembled diamond block on the adhesive, using hoop guides for alignment. Finger-press in place. Because of the white mesh backing, I used standard white bobbin thread. Embroider the chosen design as instructed. The piece can then be finished in a variety of ways. Use it in a quilt or wall hanging, make a pillow, or add lace to the edges for a lovely table-top doily. If there are topics you would like to see covered in this blog, let me know. A very Merry Christmas and blessed New Year to all of the creative people at AnnTheGran.com! Those blocks are very pretty! Use the blocks for a purse or tote bag, too. Oh so pretty! 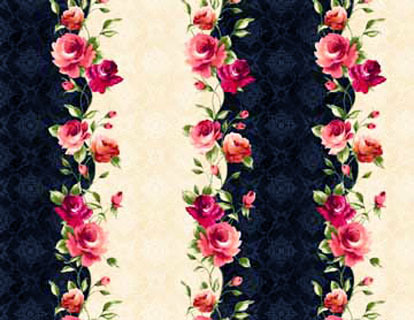 I could see this in a table runner.